Two 57 mm/81 ZIF-75 Quad Mounts on unidentified Kanin class missile destroyer in 1983. U.S. Navy Photograph No. DN-ST-84-01633. This weapon was developed from the earlier ZIF-31 and the ZIF-74 single 57 mm AA mounting, which was started in 1953 and tested in 1954-55. In 1955 a requirement for a new single-barrel 57 mm mounting was drawn up and a prototype was constructed in 1956. This mounting used the ZIF-74 barrels and was designated as ZIF-71. By 1960 fifty mountings of this type were built of which 42 remained in 1991. Development of a quad mount using the same ZIF-74 barrels was begun in 1954 and was designated as ZIF-75. The prototype mounting was produced in 1956 and trials with it lasted until 1960. The trials revealed that that maximum burst could be no longer than 50 rounds, after which the gun had to be cooled down for 1.5 minutes with a fire hose. A further problem was the long reload time, some 2.5 to 3 minutes for all four barrels even with four reloaders. A fully loaded weapon could fire for about 28-30 seconds until the ammunition ran out. A total of 54 ZIF-75 mounts were built. These weapons had significant operational problems, most of them connected to the fact that they were in open mounts, which caused problems for ships operating in the Arctic Ocean and meant that they lacked NBC protection. The guns themselves were clip fed, which lowered down their practical rate of fire. However, the main problem was that the barrels were air cooled, which led to overheating problems even for short bursts. The guns could fire only 50 shots per barrel before water from a fire hose had to be run through the barrel to cool it down. All of this prompted the navy to request the design of the completely new mount in 1956 which eventually became the AK-725. The barrel was of monobloc construction with flash suppresser. The automatic mechanism was recoil-operated. Clips hold four rounds. In addition to the standard air-cooled version, the People's Republic of China has developed a water-cooled version of this gun known as the Type 76 which uses more powerful ammunition. ^The Army S-60 fires the same ammunition. ^Army guns are also supplied with APC rounds (BR-281 and BR-281U). Both of these use a ballistic cap and can pierce roughly 9.6 cm of armor at 0 degrees obliquity at 1,000 meters. 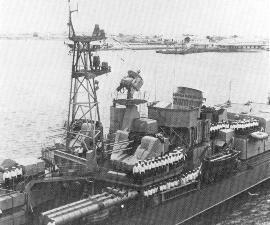 Quad 57 mm/81 ZIF-75 mountings on a Krupny-class destroyer. US Navy Photograph. 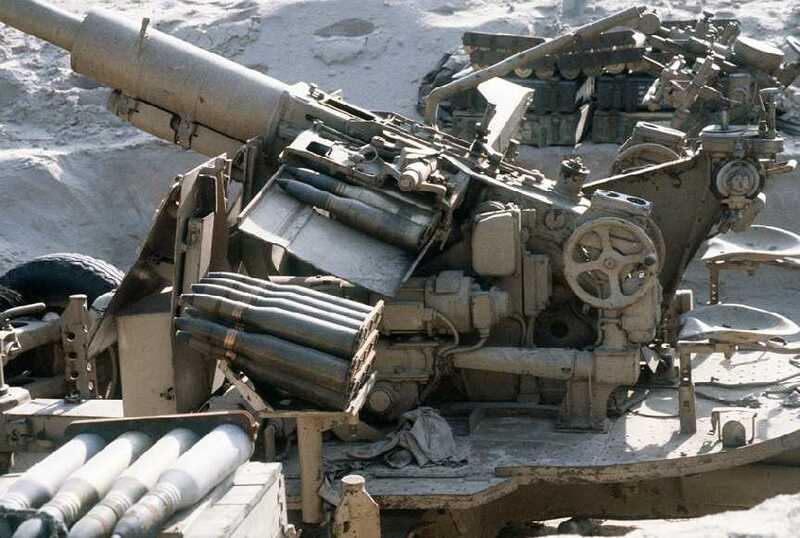 Iraqi 57 mm S-60 in February 1991. These weapons used the same clip-fed ammunition as did the ZIF-74. U.S. Army Photograph No. DM-ST-91-11947.